When I was expecting my second son, I wanted to do something to commemorate my last pregnancy, but I felt too shy to book one of those fancy maternity photo shoots. Well, truthfully, I kind of did want to do one of those fancy maternity photo shoots, but every photographer I fell in love with came with a price tag that sent me into Braxton Hicks. I know it sort of looks like my belly is about to poke you right in the damn face here, but ignore the strained protrusion effect and check out that design. Cool, right? She even featured the letter D in the middle for our son’s name, Dylan. It took about an hour, and it was a surprisingly pleasant sensation—almost like a massage. She used wonderful-smelling lavender oils, and the sensation of the henna dispenser thingie was like having someone lightly trace your skin with their fingernail. If I remember correctly, she even played some music during the process, making the whole experience even more relaxing. I can’t remember for sure how long the faded design lasted—maybe 10 days or so? At a total of $80 (she charged $60 and I added a $20 tip), it was definitely worth it, both for the lovely experience and the photos. If you’re wondering about the safety of using henna during pregnancy, everything I’ve read says that as long as your artist uses pure, natural henna, and not black henna (which contains para-phenylendiamine and isn’t healthy for anyone), it’s perfectly fine. 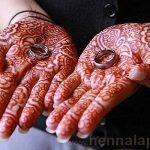 Pregnancy.org says “women have used pure henna as cosmetics for centuries and it’s one of the safest things you can put on your skin.” Of course, if you have any concerns, you should ask your doctor or midwife. I liked the idea of taking part in such a time-honored ritual—after all, women in Egypt, India, and much of the Middle East have been decorating their bellies with henna for many years to bring good luck and good health to their pregnancies. But most of all, I liked that I was able to create a unique keepsake moment of that undeniably special (if uncomfortable/gassy/heartburn-y) stage of my life. What do you think about prenatal henna tattoos? Would you ever get one?